CERANODE TUBULAR ANODES ARE RECOGNIZED WORLDWIDE! For Use in Deep, Shallow & Horizontal Anode Beds and Earth’s Natural Waters and other CP applications. CerAnode Power Rod (CPR) tubular anodes are specially designed for deep anode beds including the rigorous demands of open hole applications. They are manufactured using a unique Arc Plasma Spray processing technology developed in the early 80’s which has resulted in a state-of-the-art precious metal oxide anode with a 20-year proven track record. 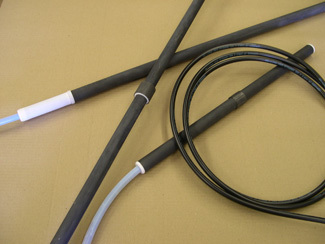 CerAnode’s CONNECTION is moisture proof and corrosion resistant with an ULTRA LOW electrical connection resistance. SINGLE CENTER-CONNECT, END-CONNECT AND STRING CONFIGURATIONS AVAILABLE. Also consider using CerAnode’s Ventrolizers sold separately for centralizing your tubular anodes. It protects the anode coating from being damaged and is not only engineered for optimal anode performance but is also very economical to purchase.